In this document we will program ARS and User Rights to allow applications (i.e. Phone Manager) to be used to return calls without the need to use the “9” prefix in the IP Office. This eliminates the issues with screen pop in applications where the 9 prefix would impact the TAPI lookup causing a failure to match the number field in the application. We will start by creating an ARS table. ARS will be activated by several User Rights short codes. The combination of short codes activated can be somewhat complex. For example, the 9N User Rights short code can activate several ARS short codes depending on the total number of digits dialed. 9N followed by 9 other digits (i.e. 9495551212) would activate 9N User Rights and 4XXXXXXXX; ARS which would dial 19495551212 as the telephone number. This is because the 9 is stripped off by the User Rights short code and 4XXXXXXXX is then passed on to the ARS table. ARS will then add back on to the front of the number a 19 resulting in 19495551212. If this all seems to complex to understand don’t worry, it just works so program away and you’ll be fine. Please keep in mind that this is not my way of allowing you to bypass dialing a 9 to make phone calls, although that is a potential side effect. This solution will only work 100% for applications that deliver information to the IP Office en bloc where the system can look at the entire number rather than one dialed digit at a time. 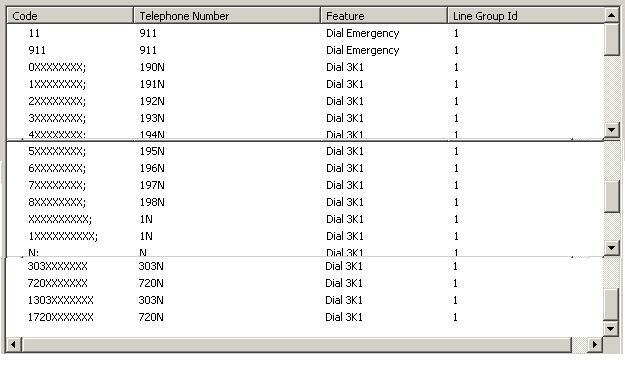 Therefor users trying to use this method to bypass dialing a 9 may have success so long as their internal numbering plan does not overlap any external telephone numbers. You’ll also notice that at least one of these short codes is completely superfluous (1XXXXXXXXXX), in that the User Rights short code 1XXXXXXXXXX delivers N, thus stripping the 1 off before sending to ARS, you would never receive 1XXXXXXXXXX in ARS. I know it doesn’t need to be there but it just looks perdy so dangit I put it in there (I just blame it on the OCD). Now that we have our ARS table in place we can assign our User Rights or User short codes. The 9N here should be obvious to anyone who has ever touched an IP Office. We don’t need a 1XXXXXXXXX because no US telephone NPA (area code) start with a 1. The 9N serves as both the 9XXXXXXXXX and the 9N and if you were to use 9XXXXXXXXX instead you wouldn’t hear secondary dial tone. 1XXXXXXXXXX really isn’t needed but again it is perdy so I leave it in just to make me happy. Additionally if you were using Outlook to place calls and your Modem properties were setup to add a 1 for long distance calls this would allow the system to strip that off and have the IP Office add its own dialing treatment.